You know you are at a well-produced dance concert when you see five trees of side lighting, each with four instruments on both sides of a small black box style theater. And, this was just the beginning of an evening of design eye candy. Sophia Stoller is an MFA candidate at CalArts and her thesis project, Lock and Key, was performed at the Sharon Disney Lund Theater at CalArts this past weekend to packed houses and enthusiastic audiences. The evening length work featured six dancers dressed in simple, grey knit jumpers. 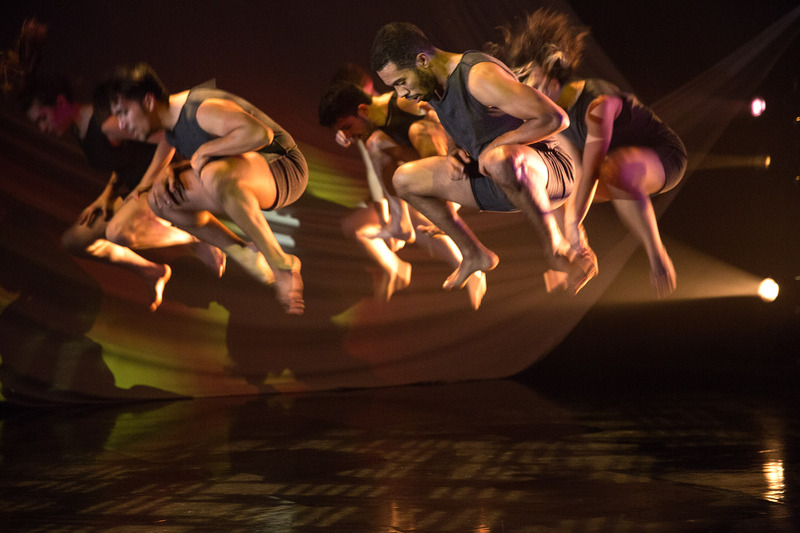 The movement was reminiscent of current trends in contemporary modern work, with its diverse palette of dynamics, powerful athleticism and nuanced shaping. 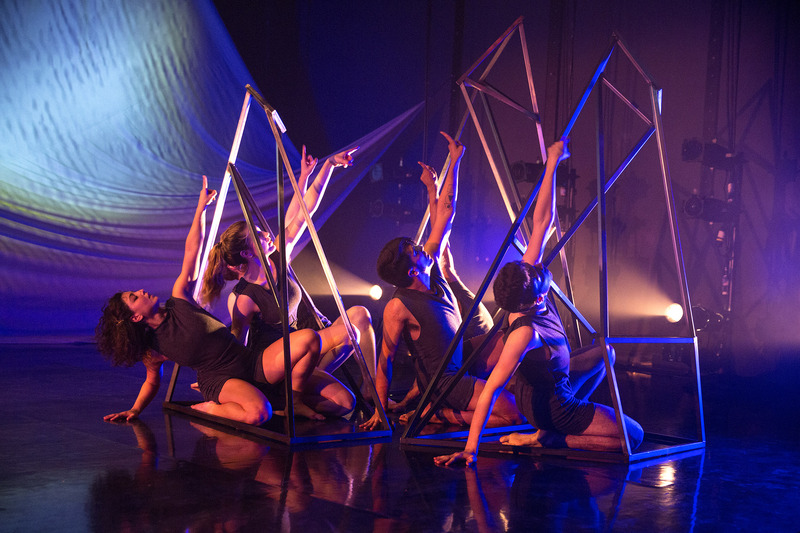 The dancers performed with strength and conviction, as well as a deeply rooted sense of emotional intention and purpose. The set of the piece included three crystalline forms of welded metal. It reminded me of Laban’s space harmony imagery, a mix of three-dimensional geometry and planes of space converged on each other. The dancers frequently interacted with these metal structures with a sense of duress, crawling inside and through the welded metal bars, hanging within them, and pressing outward against them. These metal structures seemed like jail cells at times and safe havens at others, but always as a contentious presence in their rigidity and unfeeling nature. The set also included a large swath of light material, sewn with a triangular pattern, reflecting the geometry of the metal sculptures. This piece of fabric became a screen for front projections, a scrim for shadow play behind it, and a retreat for dancers who occasionally disappeared behind it. 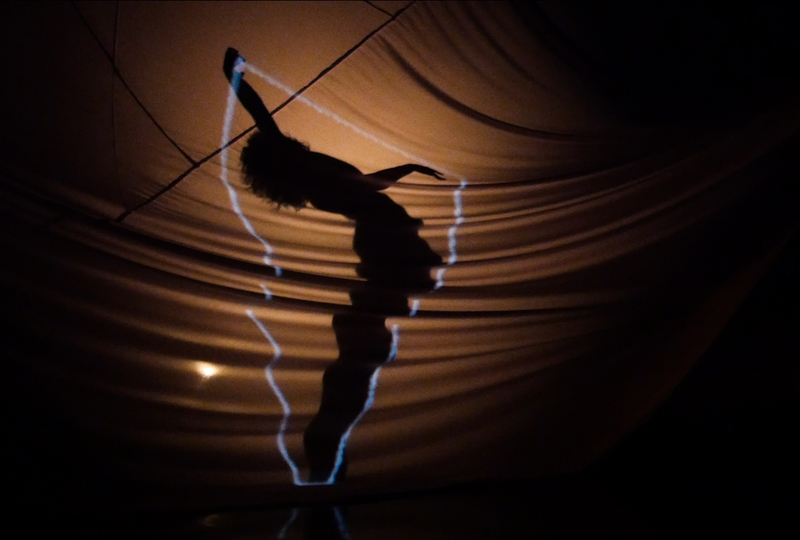 The projection of a line sketch that formed and reformed itself around the body of a solo dancer behind the fabric was one of the most provocative images of the evening. The dancer moved from small shapes to extended shapes in perfect synchronicity with the sketched outline that reinforced some of the spatial points noted earlier, reinforcing my belief that this work was strongly influence by Laban’s spatial theory or other spatial design principles. The overhead projections throwing shapes of light down on the dancers was less effective, as it was more difficult to see with the lighting. However, the video captured of the dancers from overhead was an interesting visual, as their image as taken from a bird’s eye view and projected onto the fabric in what seemed like real time. There is so much to describe in this work because there were so many different visual and lighting design elements. Unfortunately, the variety of design concepts scattered the effect of the piece as a whole to some degree. With so many different moving parts, the work felt more like a series of provocative images, rather than a cohesive evening length work. While this in and of itself is not a problem, it did not match the emotional intensity of the dancers. I got the impression that this piece was supposed to go somewhere, that the concept of being captive and finding freedom which was so embedded in the imagery and movement was a part of a journey that just wasn’t coming across clearly. The intimation of narrative was seen again in the final image, as the female dancer reached through the bank of footlights into the unknown. But, the emotional path for her journey was obscured by the presence of the many other images. In short, this piece was so full of great images and ideas, that I fear it lost its potency as a theatrical dance work. Stoller is a gifted creator who clearly has vision and ambition. I only wonder if by having everything at her disposal, she was unable to select the most powerful ingredients to cook up her evening length work. Yet, I have no doubt that Stoller is at the beginning of a rich life of dance making and concert production. Lock and Key was an ambitious creation that represented the scope of creative energy available to her. The imagery was powerful and her ability to collaborate with other artists was evident as the work shared a consistent aesthetic that can be credited to her skills as director. Bursting with great images and ideas is a good “problem” to have, and I am sure Stoller, like all artists, will refine her voice and vision as dance maker and storyteller in the many years of productivity ahead of her. Choreography/ Direction/Concept by Sophie Stoller. Music and sound design by Justin Scheid. Lighting design by Aron Altmark. Video design my Jesse Garrison. Set design by Stevie Anne Namazee. Costume design by Christine Bald. Performed by Brance William Souza, Elizabeth Houlton, Jake Harkey, Jenna Eady, Manuel Meza and Tariq Mitri.